1. 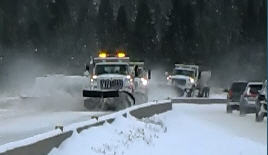 What are the experiences of other state DOTs and transit organizations in using AVL technology in winter maintenance? 2. What are some of the benefits and challenges in using AVL technology? 3. What are the common equipment or devices, material, and vendors that offer reliable AVL technologies? 4. What are some of the best practices in using AVL technology in winter maintenance operations? 5. What are some of the shortcomings of commercially available systems and services in this area?